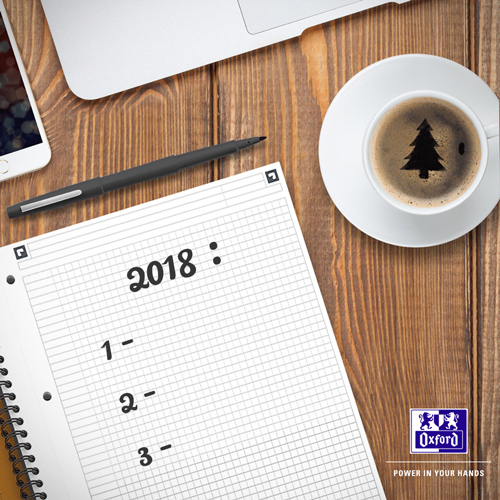 The ZTD method: 10 good resolutions you can adopt to make you more productive and better organised in 2018! My desk is collapsing under the weight of paper on it. My inbox tells me every morning that I have more than 200 unread messages. In short, I’m not exactly a pro when it comes to organisation. But this year, I’ve made up my mind: it’s all going to change with the Zen to Done or ZTD method! Invented by Leo Babauta, author of the blog zenhabits.net, its aim is to provide simple solutions to day-to-day problems of organisation. I collect my ideas as they come and I often have lots during the course of a day, but they evaporate as quickly as they appear. I regularly take notes to keep track of them all. I use a small notebook that’s easy to carry around, so I can write down everything that comes into my head. As soon as there’s time, I re-read it and transfer the best ideas to my “to do” list, in my projects file or diary. I process all my information at least once a day, whether that’s my e-mails, correspondence, voicemail messages, meeting notes or notes from my notebook. I start by tackling the most recent information and take whatever actions are needed: file, plan, defer, delegate, throw! I plan my work tasks for the week. Each day, I prioritise three, which have to be done that day, and do them as soon as possible. Then I can concentrate more effectively on the rest, or even get ahead of myself. I remember to update my schedule as soon as a task is done. The ideal tool for making planning easier: a dedicated calendar. I do one thing at a time and I say no to multitasking, i.e. sending an e-mail, answering the phone and re-reading a file all at the same time: if you want to do something properly, you can only do one thing at a time! Above all, I don’t allow myself to be distracted, because it’s difficult to regain your concentration once you’ve been interrupted. So I cut out all sources of distraction: a notification when an e-mail or text arrives, the sound of the phone, open tabs in my web browser, files scattered over my desk, etc. If I’m working in an open-plan office, I take myself off to a meeting room where it’s quiet. I write lists of simple tasks every day, grouped by topic: home, office, projects, shopping, etc. I can use my notebook, for example, to limit the number of things I have to carry around, this time starting at the end, so that information doesn’t get muddled between them. I organise my work space: I declutter my office by finding a place for everything. I equip myself with filing tools: files, plastic wallets, dividers, etc. I make sure I organise things as I go, so that I always have a workspace where I can concentrate. I review my objectives every week. I take stock of what I’ve achieved and what I still have left to do, which means that what I’m going to do next is always in my head. If I haven’t achieved my objectives, I try to understand why, and identify how to improve my organisation. I do the same thing once a month and once a year, but in more depth. I set my priorities. I ignore any tasks or projects that aren’t essential and I concentrate on what’s important to achieve my objectives. I ask myself the right questions to establish what my priorities are: is this meeting really useful at this stage of the project? Do I definitely need this information now, or could it wait until the end of the week? I set routines. Apart from specific events, such as a client appointment or team meeting, I try to start my day with an organisational ritual, which is always the same: answer my e-mails, file my paperwork, confirm my appointments, write my to do lists, review my schedule, etc. Before I leave work, I do the same thing again: delete e-mails I’ve dealt with, cross out tasks I’ve completed on my notes, tidy my desk, file loose papers, etc. I seek out things I am passionate about. When you like what you do, you tend to procrastinate less and always want to do better. If I’m dragging my feet on my way to work, it’s time to ask myself some questions. So I try to identify what I’m finding stressful or what I can’t handle: is it the environment, management, customers, tasks or personal relationships? I talk about it to my colleagues, my managers and friends who are willing to help. And if I can’t find my motivation, don’t people say that the start of the year is the best time for changing your job or even your life?! By adopting the principles of the ZTD method, I’m making some positive resolutions about how I organise my life. And very soon, they’ll become habits, which are precious allies when it comes to making me even more effective on a day-to-day basis! Previous Post:Managers: learn to delegate!